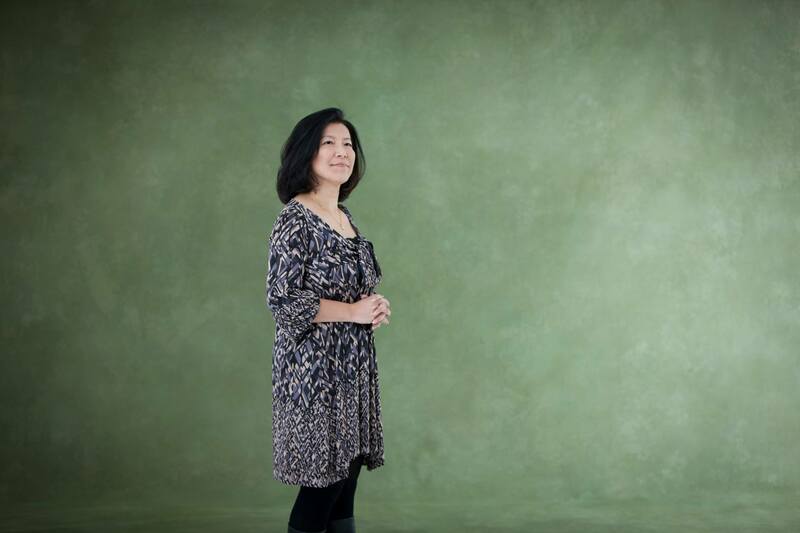 Yoko Shimomura, the composer for the KINGDOM HEARTS series. 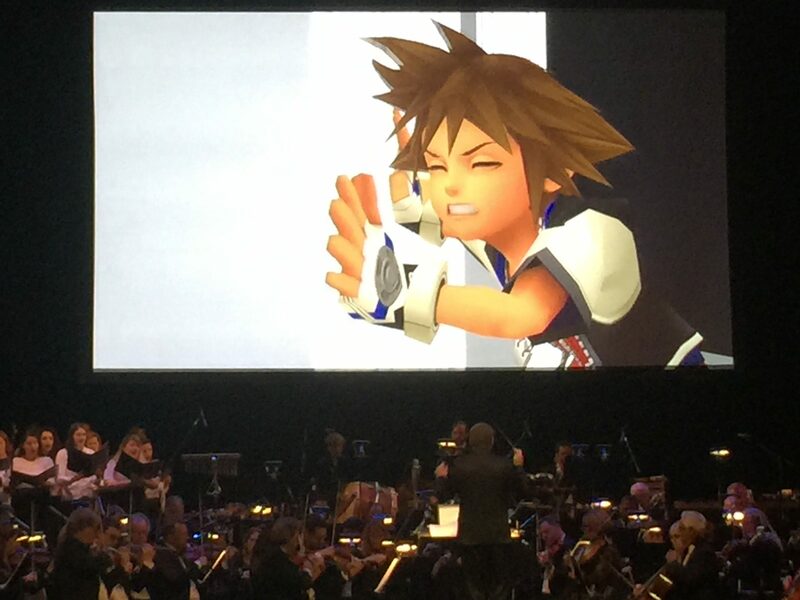 I am, unabashedly, a fan of KINGDOM HEARTS. I have played all of the games (KINGDOM HEARTS Re:coded included! ), read the manga, and I even made earrings out of Oblivion and Oathkeeper once for a lady to celebrate her birthday. 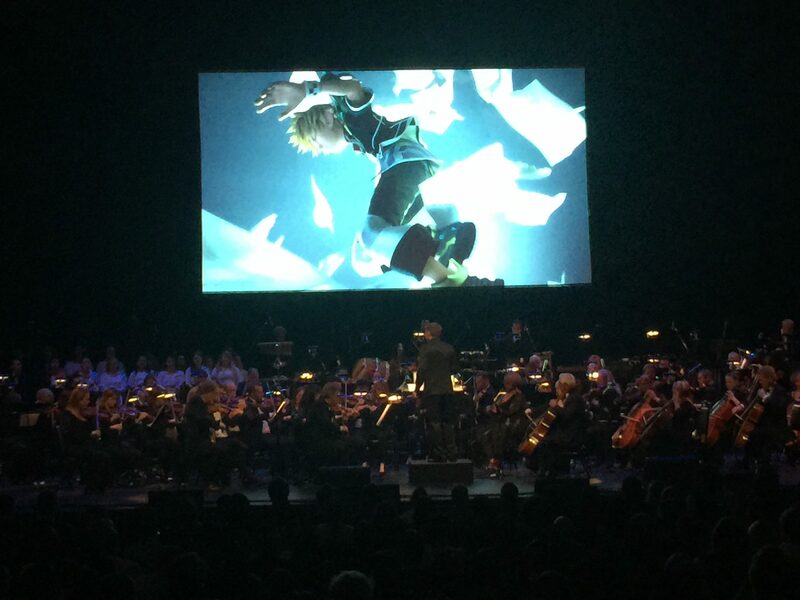 So when it was announced that the KINGDOM HEARTS Orchestra -World Tour- would be coming to the famed Dolby Theater in California to coincide with E3 2017, I jumped at the opportunity to purchase a ticket for the June 14, 2017 performance. 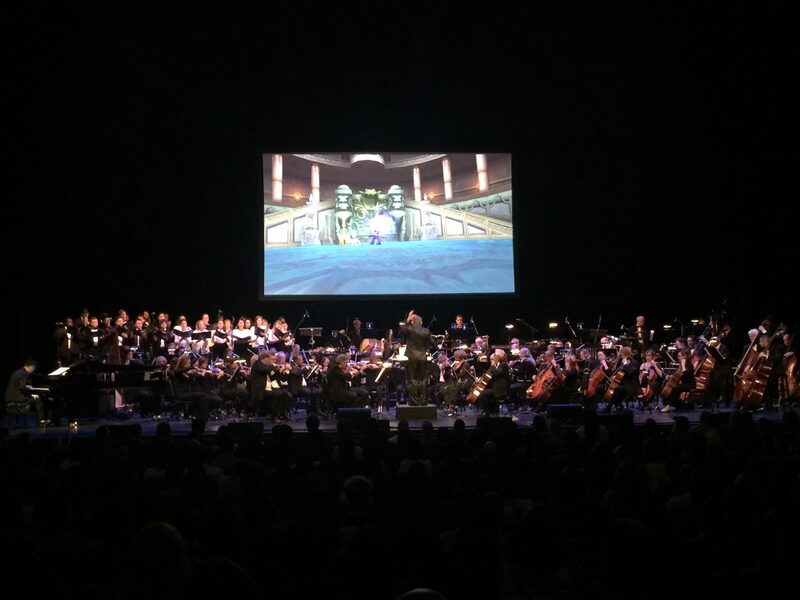 KINGDOM HEARTS Orchestra -World Tour- is similar to other video game orchestra performances such as Distant Worlds: Music from FINAL FANTASY or The Legend of Zelda: Symphony of the Goddesses. 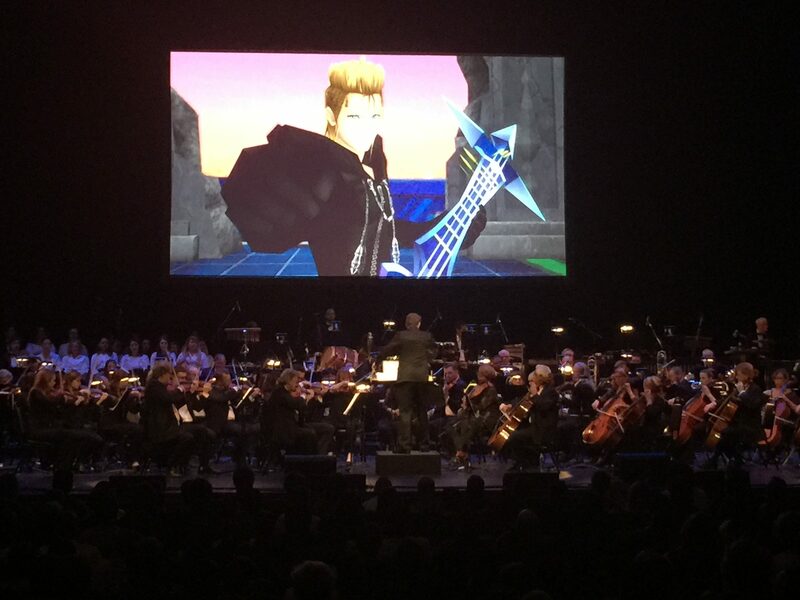 Just like in those two other concert series, the orchestra plays various musical selections/arrangements from KINGDOM HEARTS, and the compositions are set against a backdrop of cinema cutscenes from the franchises’ various titles. 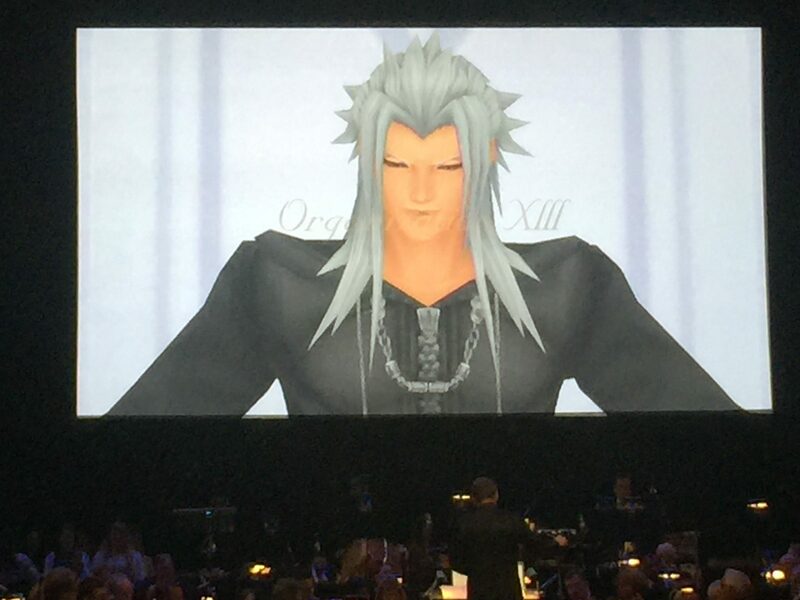 2) Dearly Beloved -KH II Ver. 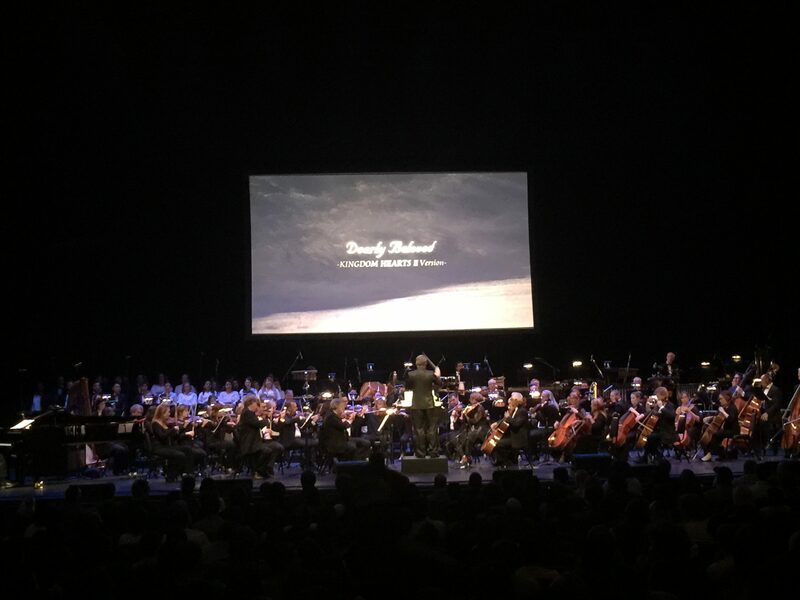 The orchestra that performed the concert was fantastic, and there was a definite thrill to hearing music that I was so used to only hearing in the KINGDOM HEARTS games or via an OST soundtrack live. 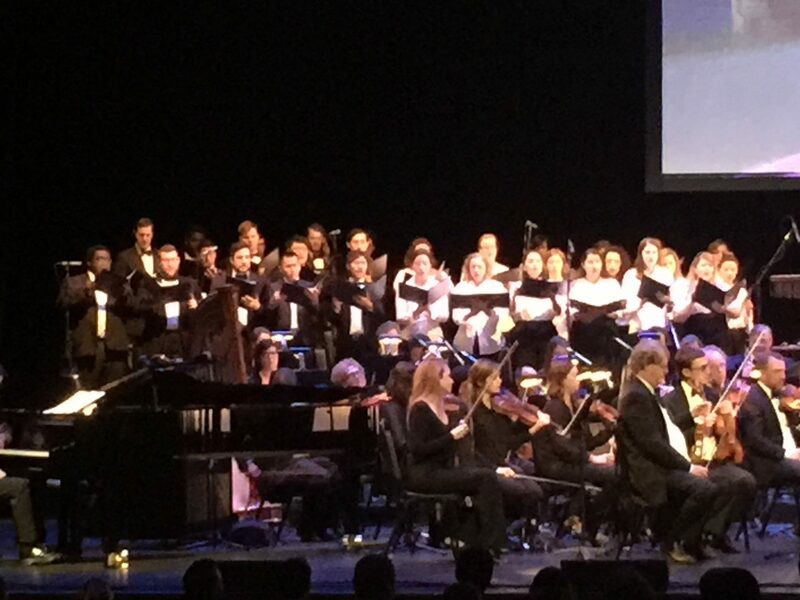 During certain pieces, such as Destati, a live choir was also utilized and I remember being surprised very early on at how well they were seamlessly integrated into the orchestra. 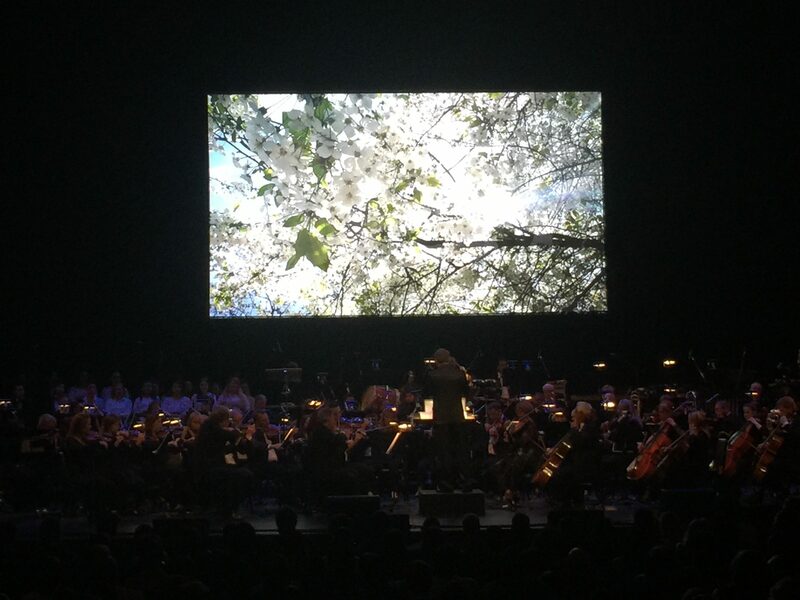 The choir definitely impressed me during the concert, especially with how well they meshed with the orchestra. 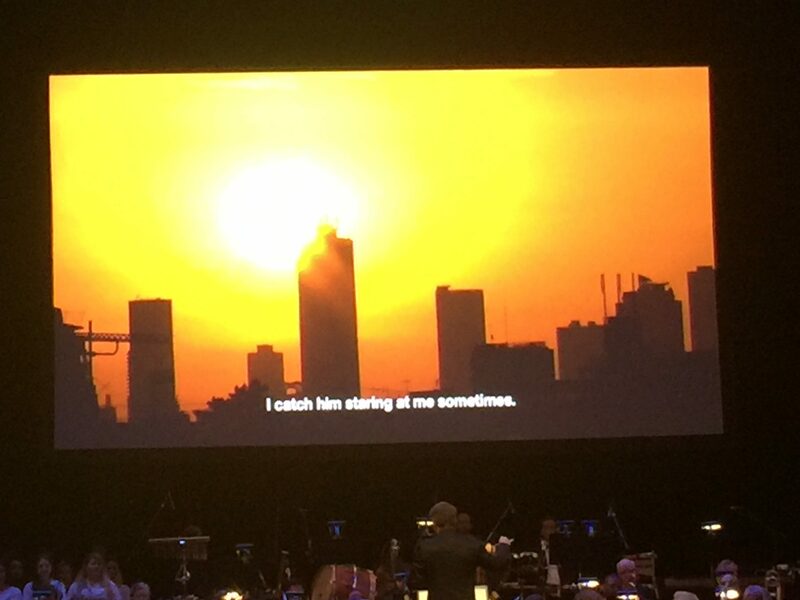 (Photos taken with permission during the performance of Destati). 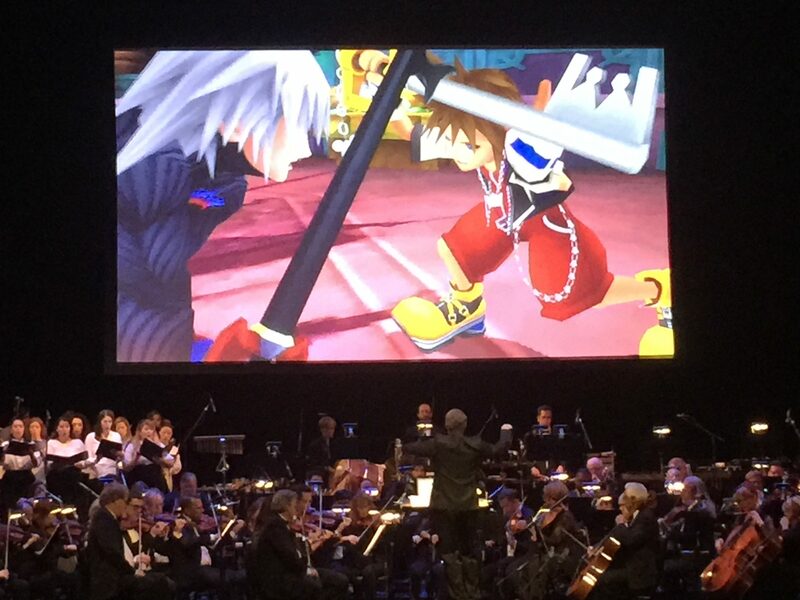 As KINGDOM HEARTS is a video game series that has expanded far, far beyond just KINGDOM HEARTS I and KINGDOM HEARTS II, it was quite appropriate that all of the games were represented in some form or another during the concert. This even includes the include the latest two entries: KINGDOM HEARTS 0.2 Birth by Sleep -A fragmentary passage-, the cinematic KINGDOM HEARTS χ Back Cover from the PlayStation 4 exclusive KINGDOM HEARTS HD 2.8 Final Chapter Prologue released in January 2017, and some video footage from the iOS/Android mobile game KINGDOM HEARTS χ. 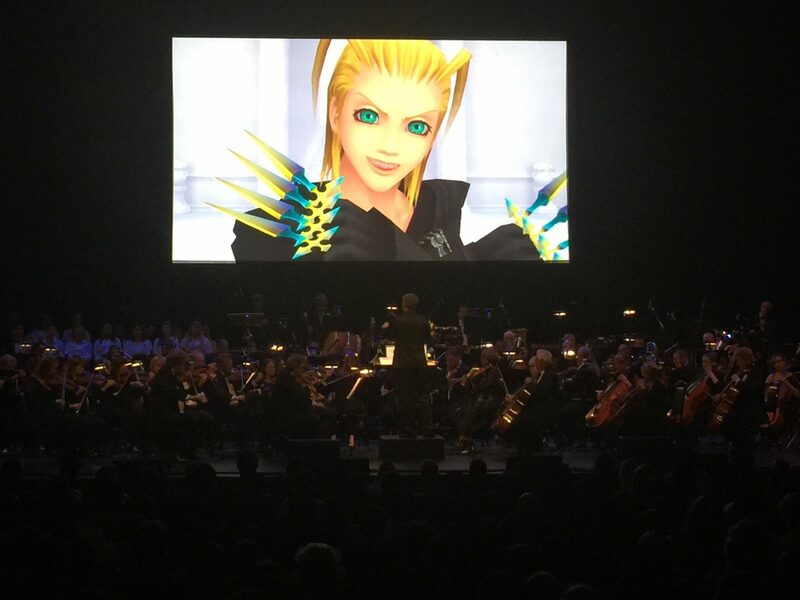 The concert-exclusive canon cutscenes were well scripted and performed, and even though they were each fairly short, I was found myself still entranced by the leading ladies of the KINGDOM HEARTS series. 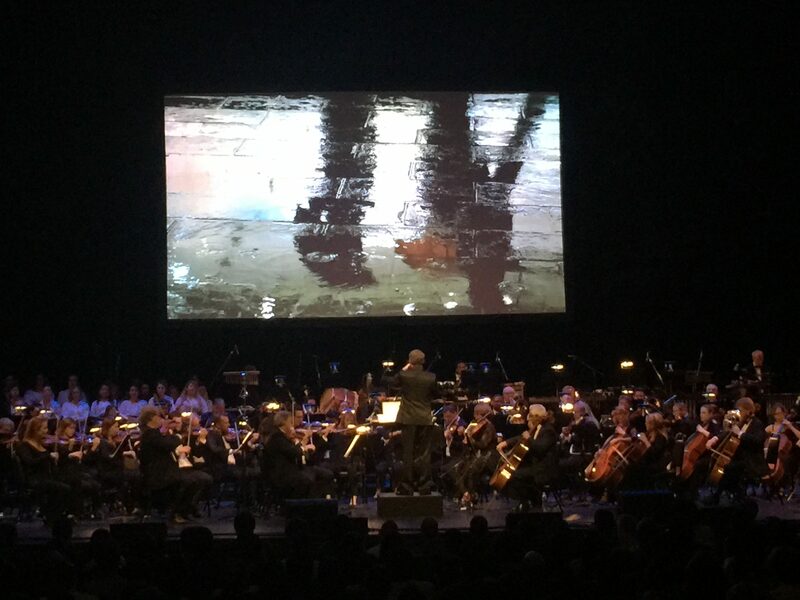 All of the cinematics were supervised by KINGDOM HEARTS’ director Testuya Nomura, and all but three pieces of the concert were set against a montage of clips from the KINGDOM HEARTS franchise. Of the three outliers, Dearly Beloved -KHII Ver. was set against a series of real-world video clips that ranged from ocean waves lapping against the shore to a city at dawn, that was obviously meant to be more abstract than concrete cutscenes from the games. 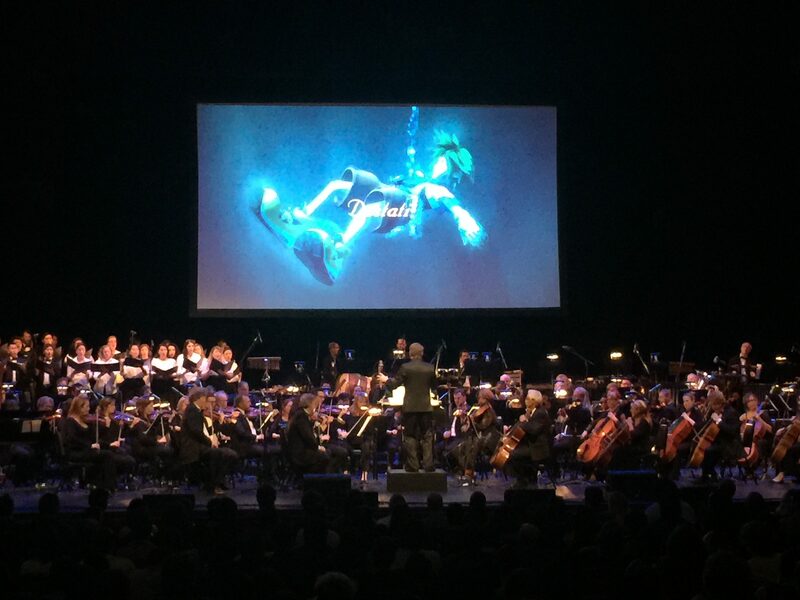 Fantasie alla Marcia was set against the credits for the concert itself while Yoko Shimomura, the composer for the KINGDOM HEARTS series, accompanied the orchestra on the piano. 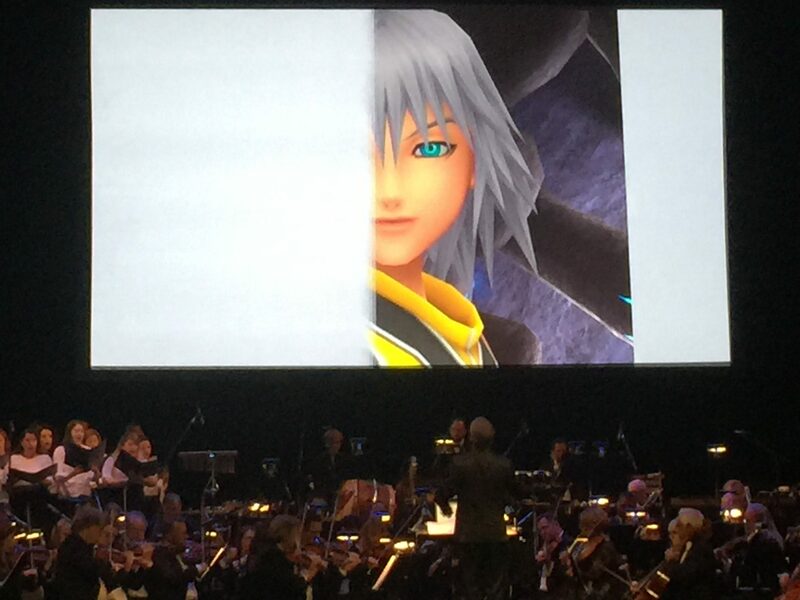 Kairi’s monologue served both as the lead-in and accompaniment for Dearly Beloved -KH II Ver. 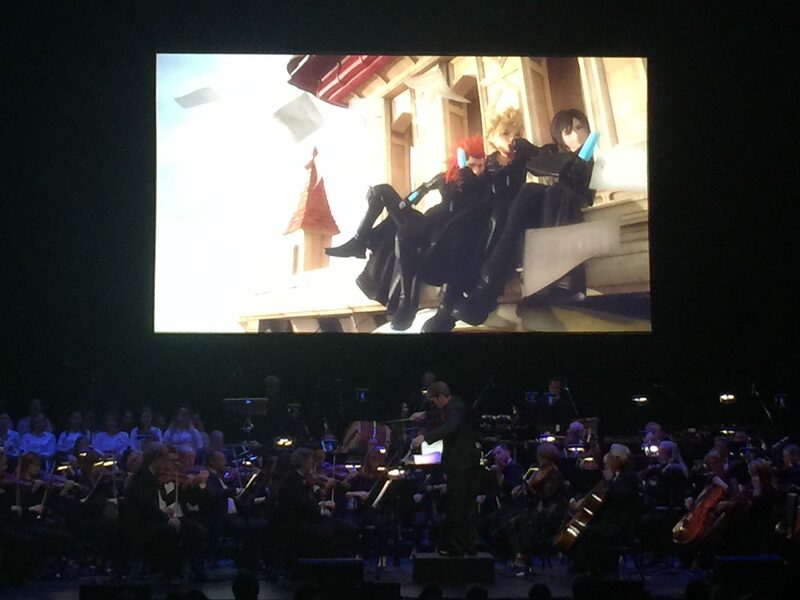 This musical piece did not contain video of the the in-game worlds but instead had real life video clips accompanying it instead. (Photos taken with permission). The third exception, Twinkle Twinkle Holidays (which was a medley of Nightmare Before Christmas’ Christmas Town in KINGDOM HEARTS II and Neverland in KINGDOM HEARTS I when flying around Big Ben), curiously had no video accompaniment aside from the composition’s title card, and I cannot tell if this was done on purpose or if it was a glitch with the video. 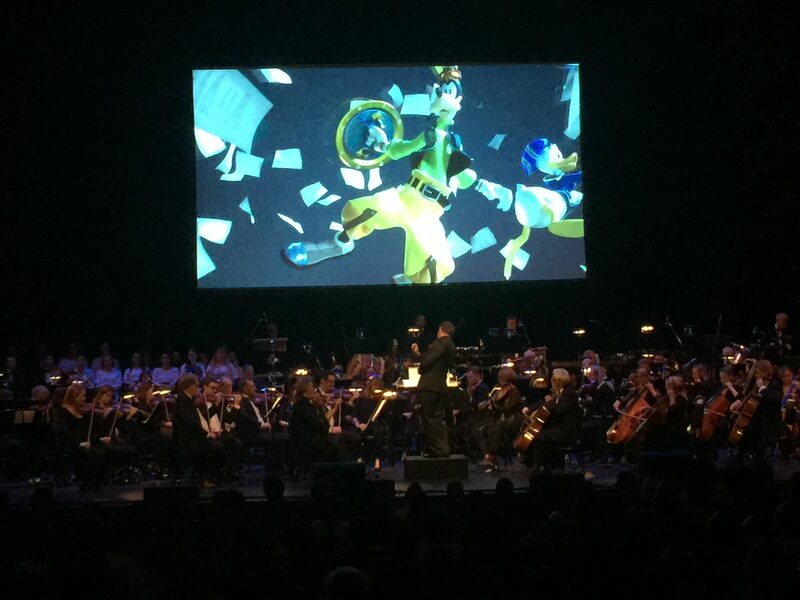 Due to the focus being placed solely on the orchestra for Twinkle Twinkle Holidays as a result, it became abundantly clear that the strength of the video game concert genre comes not just from the music, but from the videos themselves, as the overall piece (while performed amazingly by the orchestra, and I still definitely enjoyed it) ended up lacking the crowd’s enthusiasm and energy that existed for the other pieces and it felt very much like the oddball as a result. This sole blip did not lessen my enjoyment of the concert, however. 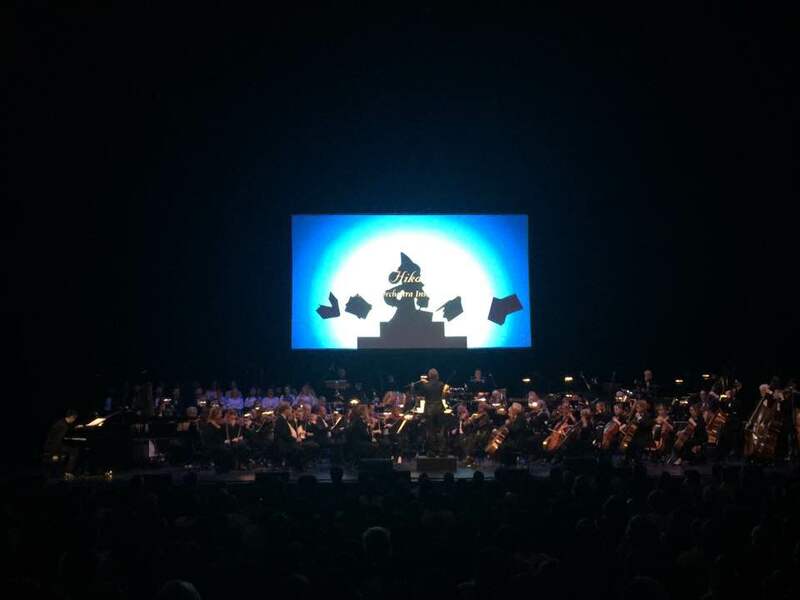 The various voiced pre-recorded tracks were overlaid the orchestra’s performance, and it was so expertly mixed that neither drowned out the other. (Taken with permission). 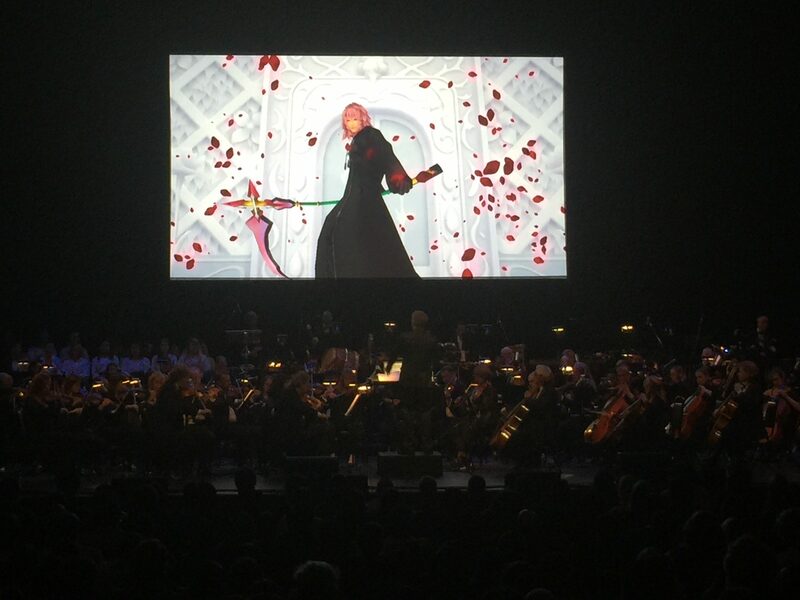 During the concert itself, Yoko Shimomura (with a top notch translator, as Shimomura-san does not speak English) appeared on stage during several occasions to thunderous applause each time, and it was obvious that she was clearly moved by how much everyone loved and appreciated her music. 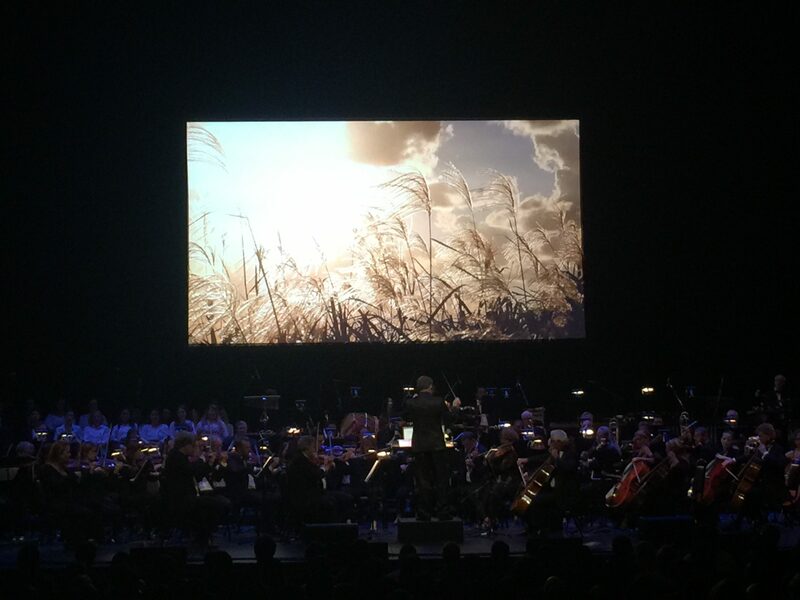 After the concert’s encore closed with Fantasie alla Marcia (which Yoko Shimomura accompanied on the piano), Shimomura-san spoke again to the audience and thanked us with great sincerity for attending and then introduced Tetsuya Nomura on stage, who promised news for KINGDOM HEARTS III at D23 (which runs July 14-16, 2017). 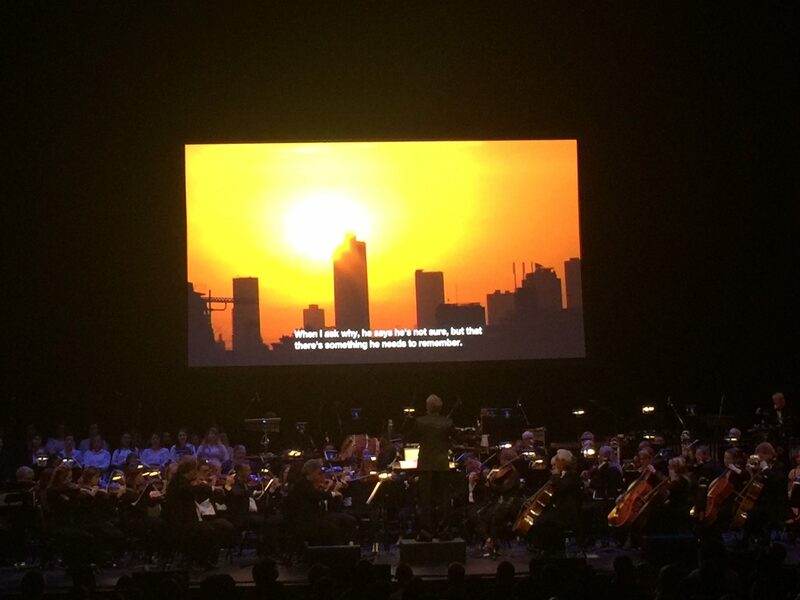 That all being said, I was more than a little bit surprised that the conductor did not address the audience as well. 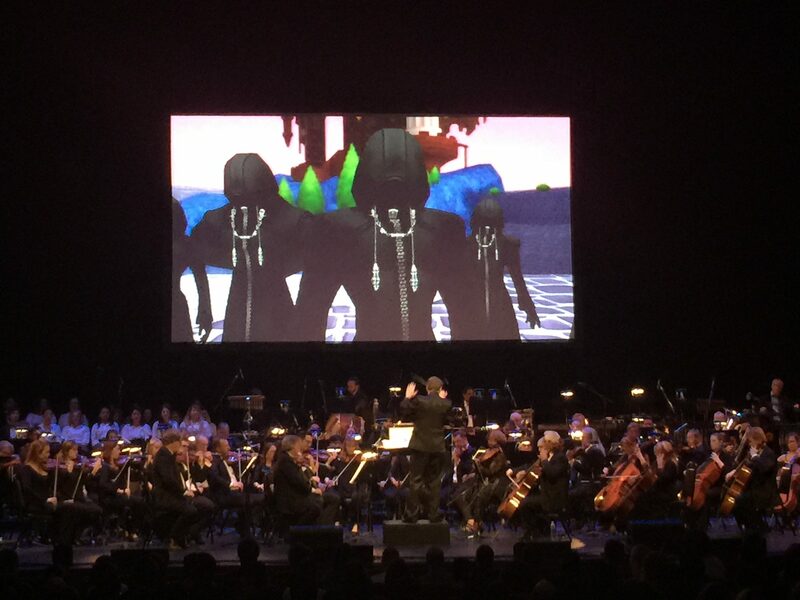 Organization XIII was the fourth piece performed during the KINGDOM HEARTS Orchestra -World Tour- Concert. 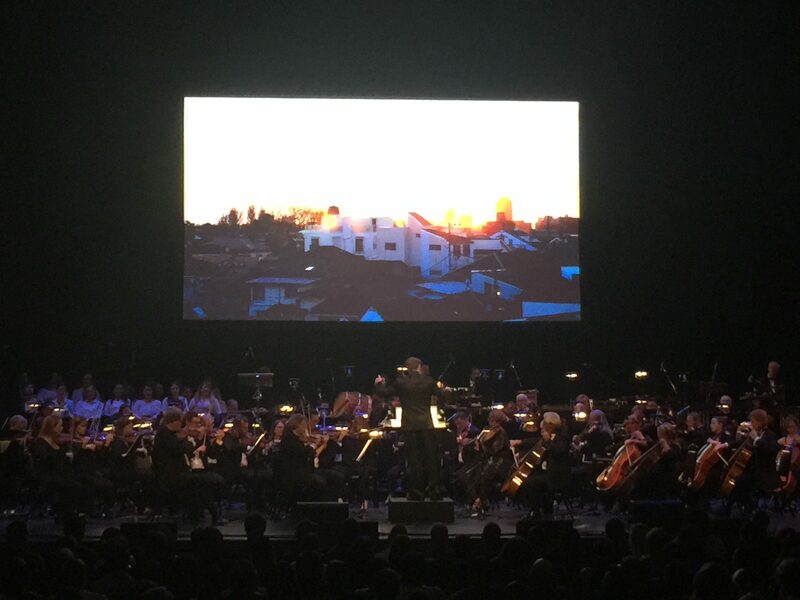 The audience clearly had their favorites, and were cheering when that Nobody would appear on screen. (All images taken with permission). Overall, I loved the concert. 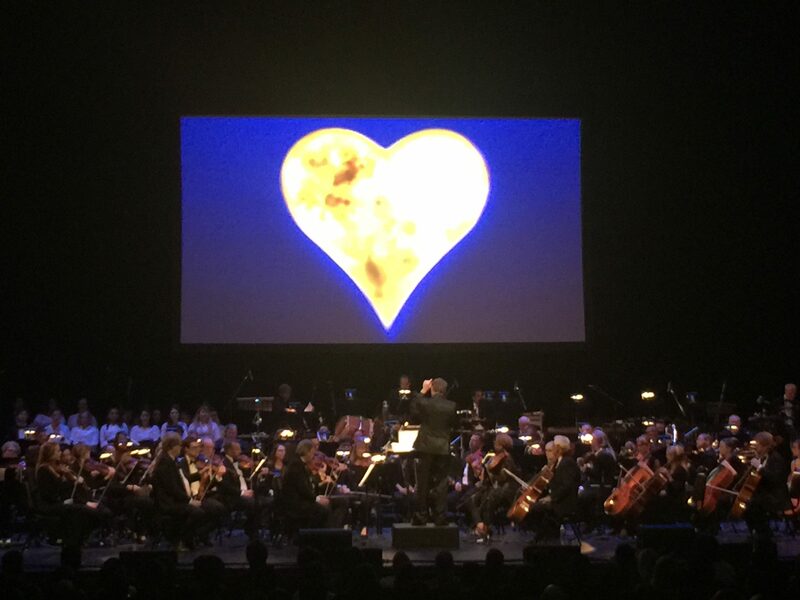 With a concert length of approximately two hours (which included the intermission), KINGDOM HEARTS Orchestra -WORLD TOUR- was an amazing opportunity to see all of the music of a series that is now entering its fifteenth year. 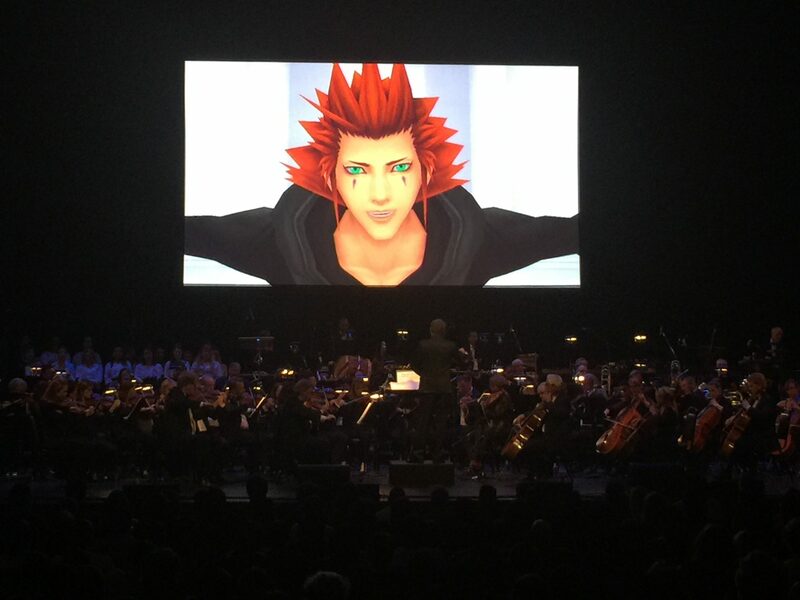 While there are no new dates announced, it is my fiercest hope that the concert series extends its run to be brought to more of the world because (to be honest) I would love to see it again. 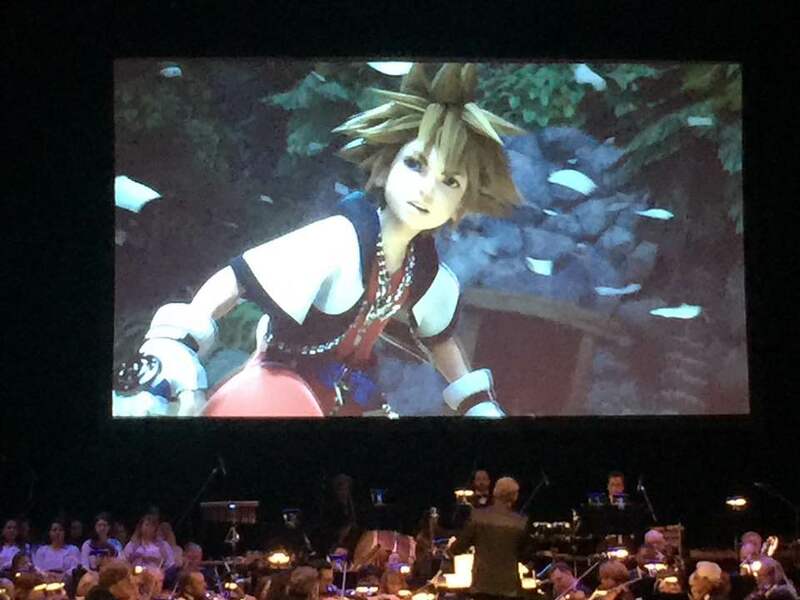 The KINGDOM HEARTS Orchestra -World Tour- CD can be preordered from the Square Enix Store (Release date August 2017). 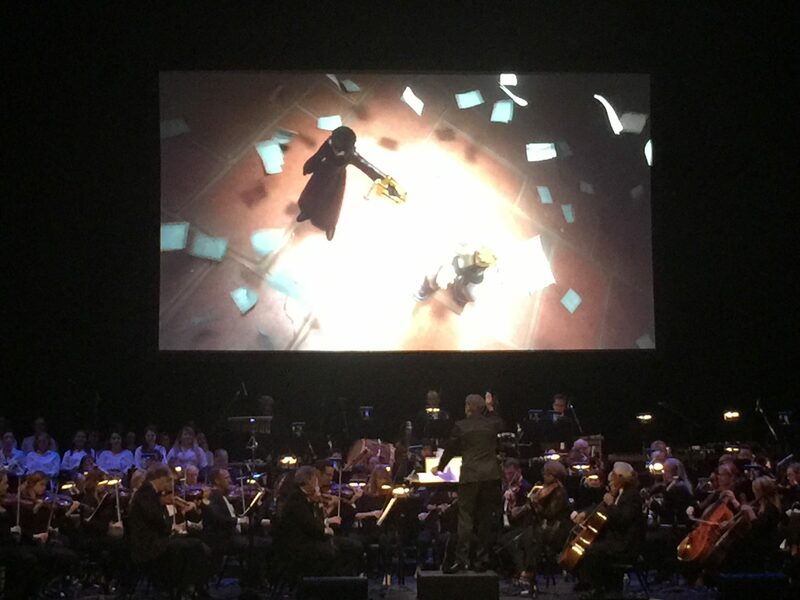 What is your favorite KINGDOM HEARTS music piece? Where would you like to see the concert come to next?